A glossy laptop screen is an electronic display with a gloss surface finish. The gloss surface finish is a highly polished shiny finish. At the time of writing glossy displays are mostly considered an upgrade option for many laptops that come only with MATTE laptop screen as standard. In certain light environments, such as at home with low light conditions, viewing the screen in bed or on a train for example, a Glossy finish screen will display better colour intensity and contrast ratios than a standard MATTE screen. The blacks look black and colours appear strong and vibrant. 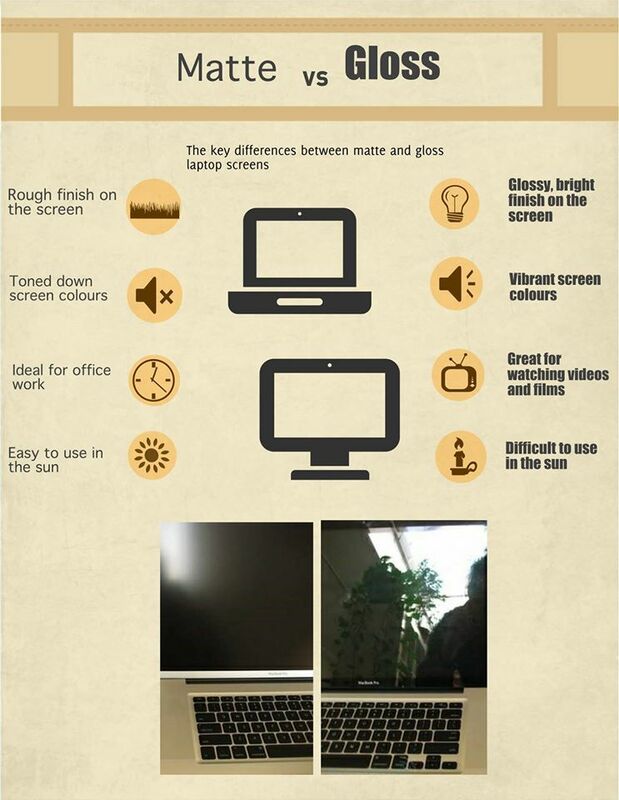 These types of screen are great for multimedia applications, media centre laptops and watching movies. 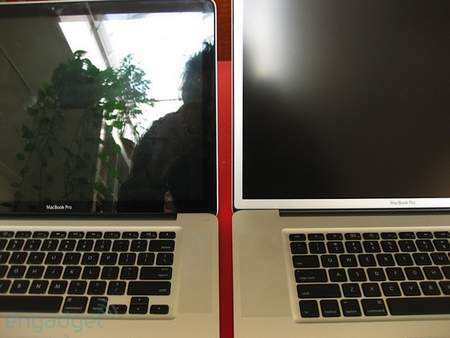 The disadvantage of using a high gloss laptop screen is that although many glossy LCDs use an optical coating to reduce reflection, they often product a glare in bright light, reflecting ambient light sources around them. In addition the highly polished finish is prone to finger marks and smudging, however unlike the rough finish found on MATTE screens, glossy finish screens are far easier to clean. Quite often on a sunny day outside when attempting to use the laptop computer you may find that you spend your time looking at your own face, rather than the contents of your desktop. Matte laptop screen is an electronic display with a roughed surface. The surface of the display is roughed, rather than being polished to give a light scattering anti glare surface. Some laptop models will only take replacement screens in MATTE, others will have a MATTE or GLOSS option. Matte displays are typically fitted to machines that are designed to be used in brightly lit environments, such as in brightly lit offices or outside in bright sunlight. Be warned however, in very bright lighting or direct sunlight, MATTE screens can disperse the light across the entire LCD panel and become unreadable. The roughing effect on the surface of a MATTE screen means the surface isn´t flat. This "rocky" surface, reflects external light in different directions, diffusing a bright light source that would otherwise cause a "glare" on a GLOSSY laptop screen. Because of the roughened surface of a MATTE screen, colours do not appear as vibrant as with a GLOSS replacement laptop screen and the contrast ratios are not as good. Blacks can often appear as a washed out grey colour, oranges and reds can appear faded and lacking in life. In addition, a very slight "blurring" can be noticed as the accuracy of the display is slightly impaired by the roughened polorised finish of the display. On the left hand side we have a GlOSSY screen, notice the reflection of the surrounding ambient light. On the right hand side we have a MATTE screen. notice how the light is diffused rather than being reflected. Matte and Gloss laptop screens both have their advantages and disadvantages, which is the reason why we often have a choice of both. We would recommend MATTE screens for people travelling with their work. Working on spreadsheets and documents on the move is far easier without the reflections of a Gloss Screen. ially if you are working in darker areas such as indoors or an unlit room for example. If you are unsure, why not visit your local laptop super store and ask for a demonstration of the two types of display. This article is very informative, thank you! Which laptop, and-or display would you chose to use outdoors these days? Obviously it would a be matte outdoor anti-reflective surface. It needs to have a lot of brightness as well I think. Personally I am looking for a 14inch+ and still affordable(no more than 1k€ let's say). so it's a matter of compromise. Maybe you've got your own ideas on that matter. Thank you.